The new Brian Bell Plaza opens to the general public for business today after being officially dedicated and blessed in the evening. The two story building stands high along the Mangola Street, the site where the previous Home Centre was situated but was tragically burnt down to ashes in a fire. 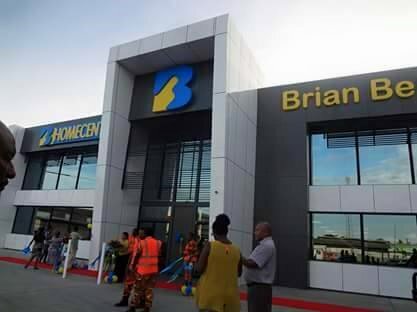 Executive Director of the Brian Bell Business group Mr. Ian Clough in an emotional speech thanked all those who had been involved in the project saying that the facilities are the result of hard work, planning and efforts the efforts of many. “All of this hard work now pays off as we open this brilliant new facility and welcome our customers to the new and improved Brian Bell Home Centre Lae” said Mr. Clough to which he further added that the range is wider than before. “We have added many other wonderful retail and service offerings that are sure to delight the Lae Community” said Mr. Clough. The Plaza’s 1st floor is lined with shops inclusive of a restaurant, café, health and beauty spa, Bank of South Pacific Banking Facilities and other specialty stores. Also present at the grand opening of the Plaza was Governor for Morobe, Kasiga Kelly Naru who congratulated the hardworking staff for ensuring that the business continues despite the past fire incidents that the and described the facility as a “magnificent shopping complex” for the people of Lae. “This is indeed a success story that Brian Bell has produced. And you are leading the way for many other businesses of this nature to come back to Lae City to make Lae the base to run your businesses” said Kasiga Naru.